The Mercury in Capricorn people are industrious people who will not take no for an answer. Straight to the point is the preference of Capricorn zodiac sign. This leaves Mercury in Capricorn little room for frills or melodrama when they speak. This no-nonsense sun sign is all about practicality, and their conversational style reflects that trait. They take their time to analyze every situation to ensure they get things right. Capricorn is one of the hardest working people, and their time is precious to them. They are big planners when it comes to the future. They break down every piece of information they have in the present before making decisions. So Mercury in Capricorn listen attentively and speak with authority when they’ve made up their mind. 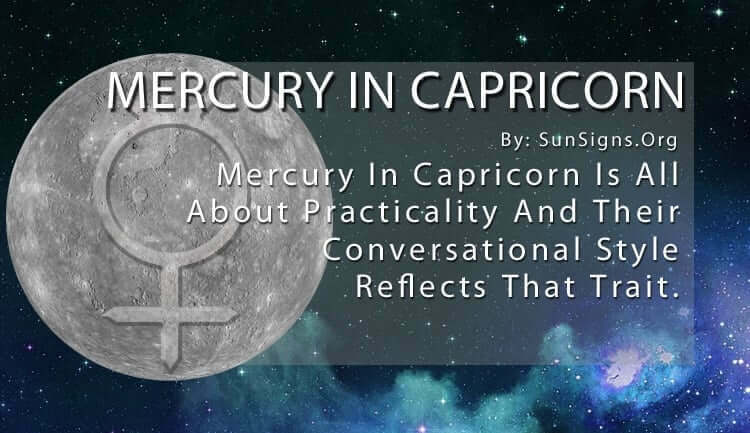 Mercury in astrology represents how we communicate and put forward our ideas to others. For Mercury in Capricorn, all of those things require a calm environment in which to think and analyze. They detest chaos and try to fend off any change that they hadn’t anticipated. They require quiet time to reflect on what’s being said and done so they can make the correct choice and move on as smoothly as possible to the next problem. While some people feel they are stalling, Mercury in Capricorn is simply taking their time to get it right the first time. Their responsible nature helps to get them out of many difficult situations. This makes Mercury in Capricorn effective communicators because they know what needs to be said and done to complete a project successfully. (Read about planets in signs). Because of their logical tendencies, the Mercury in Capricorn may seem to look down on people in judgment when they don’t agree with their tactics. But others have to understand that they take their time in coming up with a plan of attack and they demand their time and effort be respected. While some people can go with the flow and adapt to their surroundings, Capricorn is unable to do the same easily. Even though they are highly intelligent, they are also incredibly set in their ways. This often hinders their ability to think outside the box and change styles when necessary. While they may come across as dull at times, they get their points across in a clear and concise manner. But because of this efficiency, they tend to have little patience for those who speak with a flourish. This is why Mercury in Capricorn often appears to be a skeptic – they don’t take anything at face value. They dig below the surface until they are satisfied that they have unearthed every important piece of information necessary to resolve a situation. Mercury in Capricorn would rather research a topic themselves than believe facts and figures given to them by someone else. And since their strong work ethic supports this habit, it’s easier for them to form their own opinion. But this happens only after every avenue has been exhausted. The Capricorn Mercury person is careful in their assessment, absorbing every detail needed to make an intelligent decision. They don’t do anything based on instinct, and they tend to reject those who do. It’s not that they are unable to trust people. It simply takes a lot to gain their trust. They would instead do things on their own to avoid mistakes and get around potential communication problems with other styles of speaking. But their devotion and conviction to their cause mean they never let down their peers or loved ones.